Spotted over at IKEA Hacker, I love Melanie’s bench-coffee table contraption. 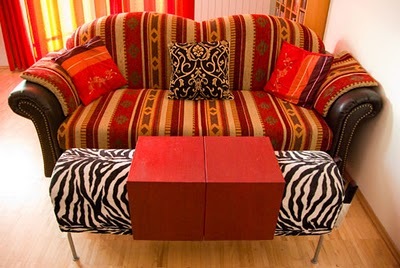 Melanie used an Ikea office bench (in zebra), a Flort remote control pocket and u-shaped tables made from plywood. For the U-shaped red tables, I went to the hardware store with the measurements of the zebra bench. There, I had sets of plywood cut in the exact right size, bought metal brackets, Spax screws and red acrylic paint – and built those U-shapes at home in an afternoon. Now those little tables can be removed from or repositioned on the zebra bench – and each table has the exact size for a laptop or an A4 paper plus some room for a cup or a glass. 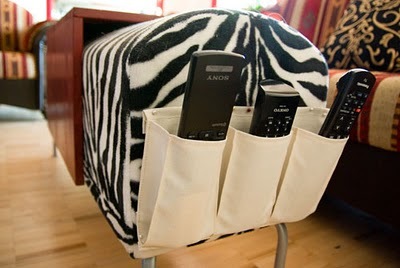 To finish the look, Melanie pinned a remote pocket to the side of the bench so her remotes would have a permanent resting place. Don’t you just love IKEA hacks? Has anyone refashioned their old IKEA furniture into new pieces de resistance?